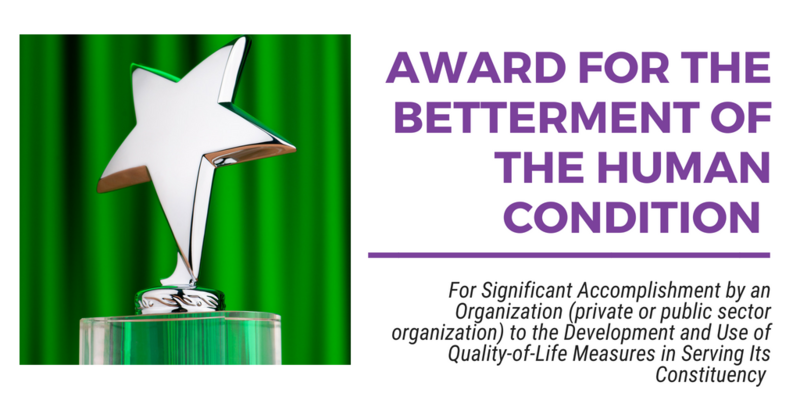 The basic requirement for eligibility for this award is significant accomplishment by an organization (private or public sector organization) to the development and use of QOL measures in serving its constituency. The Nominating Committee with the assistance of the Vice-President for External Affairs scouts possible candidates for consideration. The selected candidate is nominated by the Nominating Committee and is selected by a simple majority vote of the Board of Directors (with at least 25% of the Directors voting).